Home Costs > How Much Does Broken Garage Door Spring Repair Cost? A broken garage door spring is often the top cause of garage door failure. It can even extend its damage when it snaps powerfully and hits your car or the garage’s ceiling. With a broken spring, you may not be able to get your car out of the garage. If your springs were to break, then this is something you will need to have repaired immediately. The costs to repair your garage door springs will depend on the condition of your garage, the type of garage door you have, the type of springs required, where you live and which company is performing the job. On average, to have your springs replaced on your garage door will vary anywhere from $200 to as much as $400 if you were to hire a professional. Breaking the costs down, the springs, depending on the part needed and the size, will cost about $20 to $60 each. Add in the labor, which can be $45 to $85 per hour, depending on your location, can bring the grand total to the estimate noted. A tilt-up door, on average, will be about 20 to 30 percent less than a roll-up door. If your door has two springs and only one is broken, most professionals will most likely recommend changing both since, sooner or later, the other spring can also break down. It is also best to have the springs be of the same elasticity so that the garage door opens and closes evenly, allowing each one to wear evenly. Since most garage door spring replacement jobs are relatively straightforward, it doesn’t hurt to shop around. Consider getting multiple quotes from HomeAdvisor.com. Here, you simply explain your job and licensed contractors will email you with a no-obligation quote. Mr. Jeff Beneke, who wrote for Garages.about.com, shared that the replacement of his broken garage door springs cost him $259. Angie’s List talked with a few garage door contractors and found the average job would be in the $200 to $300 range. On this City-data.com forum thread, a forum member asked what they should pay for this repair. According to more than three pages worth of answers, the costs most people paid and recommended was within the $150 to $300 range. When you hire a professional, the first thing they will do is turn off the power as a safety precaution. They will then measure the existing door springs to make sure the new springs they order or have in stock fit accordingly. With these new springs, they will unwind the existing springs and install the new ones in its place, tightening them with screws. When tightened, the springs will be balanced, lubricated and the springs will be wound up. Lastly, the door will be tested and the tracks will be lubricated to move efficiently. After the job, most companies often include a warranty on the parts and labor for up to five years. The average job can take 45 to 90 minutes. Sometimes, while doing the spring replacement, the contractor may discover that something else may also need repairs. For example, your garage door may be considered too old and may no longer be able to operate properly with the installation of the new springs. In this case, they may recommend a brand new garage door. Beware of handymen who would recommend unnecessary replacement of a broken garage door. They may simply be trying to make more money by doing a full replacement. Do research to make sure you know the difference. When you intend to replace your garage door spring, take into consideration the longevity of the springs. The lifespan of a spring, on average, is anywhere from 5,000 or 10,000 cycles of expected wear, which will last about five to seven years. Over time, however, they will begin to weaken and will eventually break. 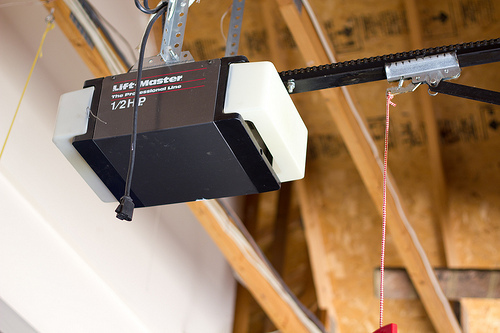 Choose the appropriate spring that complements the size and weight of your garage door. Every so often, check all of your mounting hardware and door frame track for signs of stress, loose hardware, rust, or dirt. Lubricate the track wheels for easy operation and to help the door roll easily. Keep the springs lubricated and free of rust so that they will last and serve you for a long time. With any professional job, call at least three local companies to see what each one is going to charge. Replacing or fixing a spring can be done; however, do so at your own risk as replacing a spring can be extremely dangerous. Refer to this YouTube.com video on how these springs are replaced. Squeaking isn’t a sign of faulty springs; instead, this often indicates your springs have worn down a bit and will need some lubricant. If you were to lubricate the springs and continue to hear the noise, then you may want to either consult with a professional or repair the springs yourself. If you’re having a hard time shutting your garage door or it even closes to fast, again, it doesn’t mean your springs are bad. This often means your springs are out of balance and simply need to be refitted. Spring and bearings. Took under an hour.